Redistricting has become an increasingly politicized process in Texas over the past several decades, but even more sharply so since the 1990 census. The constitutionally mandated redrawing of district lines for purposes of representation in the state legislature and the U.S. Congress has always been used to favor some interests over others. But the social and political changes that have occurred across the state in recent decades have raised the stakes  and sometimes tempers too. This heightened political tension reflects intensified party competition in the state and the pressure that built during the gradual ascendance of the Republican Party in the state Legislature. 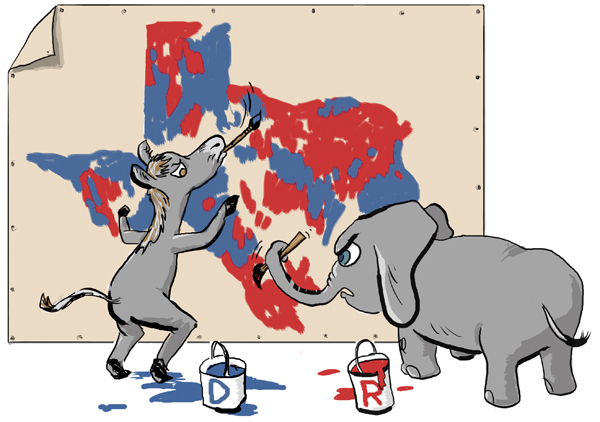 For almost a century since the end of Reconstruction in 1876, Texas was dominated by conservative white Democrats who were determined to maintain their dominance over the Legislature and other government institutions. But as the Republican Party's support began to grow in the last quarter of the twentieth century, the struggle for control of state institutions intensified. Controlling access to legislative seats during the years of Democratic dominance did not require too much political engineering. Until the reapportionment of 1921 the number of seats in the Texas House of Representatives was increased steadily to reflect the growing population until it reached the constitutional limit of 150. Even after that the rate of growth of the state's population and the rate of urbanization were slow enough that they exerted relatively little pressure on established patterns of representation. Control of the Legislature by the white establishment in the Democratic Party was also helped by a variety of legal and extra-legal devices (e.g., the white primary, intimidation) that minimized the participation of African Americans and other minorities. After the Second World War things began to change. Three major developments upset the relatively stable system of political control in the state capitol beginning in the post-World War II period: accelerating population growth and urbanization beginning in the 1950s, the strengthening of federal enforcement of civil rights and voting rights in the 1960s and 1970s, and the resurgence of the Republican Party beginning in earnest in the 1980s. One of the requirements of Civil Rights era legislation is that states that had a history of racial discrimination (generally, the states that constituted the Confederacy, including Texas) must obtain "pre-clearance" of all redistricting plans from the U.S. Department of Justice. This is because of the tendency of those states to engage in so-called "racial gerrymandering"  configuring districts in order to minimize minority representation. This can be done either by concentrating minorities in as few districts as possible (minority vote concentration), or distributing them across many districts (minority vote dilution). Even though almost four decades have passed since the adoption of the Voting Rights Act of 1965, concern with minority representation continues. Indeed, as party competition has intensified, the distribution of minority voters in urban districts has become a central concern of both political parties and the state and federal courts.